When Beth Zerilli told her 8-year-old daughter that she planned to run the 2014 Boston Marathon, Sophie burst into tears. “She said, ‘You can’t do that. You’re going to get hurt,’” Zerilli recalled. Sophie’s fears made sense. 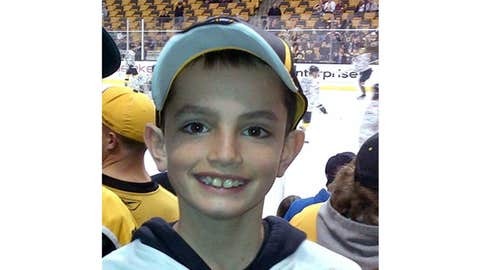 Most of what Sophie knew about the Boston Marathon was related to the tragic events of the 2013 Marathon, which struck particularly close to home since the Zerillis’ college friends, Bill and Denise Richard, lost their 8-year-old son Martin in the bombings. Zerilli’s husband, Sal, lived with Bill Richard and another friend, Larry Marchese, in college when they were in the same fraternity at Bridgewater State. The three men and their significant others all grew to be close friends by the time they graduated. But when the Zerillis moved out of state after college – first to Los Angeles, then Seattle and Toronto – the couples were busy raising their own families and it proved difficult to stay in touch more than a phone call every now and then updating each other on the latest in everyone’s lives. I just felt like this year, if I’m going to run another Boston, this would be the year I would want to run it. Then came a life-changing call last April from Marchese. The Zerillis were in Canada on Marathon Monday to finish packing up their home in Toronto since they had moved back to Massachusetts in January. The cable was already disconnected, so they had no Internet or television to tell them what was going on in Boston. The Zerillis did not know how bad it was until Monday night, when they received a call from Marchese telling them Martin was killed and his younger sister Jane lost her leg. The Zerillis continued to help in any way they could in the following months, as they kept tabs on how the Richards were doing, supported them at the memorial mass for Martin in June, and donated to The Martin W. Richard Charitable Foundation as soon as it was set up. When the foundation’s marathon team, Team MR8, announced in January that it had 75 spots open to those who wanted to run the 2014 Marathon, Beth knew it was something she had to do. Zerilli, a seven-time marathon runner, ran the Boston Marathon officially in 1998 and as a “bandit” (a runner without a number) in 2000. She ran marathons in other cities as well but said the Boston Marathon holds a special place in her heart. “There’s nothing like Boston,” Zerilli said. “When you’re from Massachusetts and you grew up with the Boston Marathon, it was kind of a part of our family as well. It’s just something to be dropped off in Hopkinton and have to run home. The application process to run as a member of Team MR8 was lengthy. Questions covered everything from how many miles applicants were already able to run to whether the applicant was a skier or would be willing to give up skiing for the winter so that a freak injury would not keep the applicant from running the marathon. Our series chronicles more than two dozen people directly affected by the bombing at the 2013 marathon. Here are their stories. When Zerilli was finally accepted, she joined a diverse group of runners, ranging from the Richard family’s neighbors to some of Martin’s sports coaches to strangers from other states who were touched by the family’s story. Each runner on Team MR8 must raise $7,500 for the foundation, and Zerilli raised two-thirds of that total simply by spreading the word on Facebook and at work. Local business also offered to help out by donating a portion of their proceeds on a certain night to Team MR8. 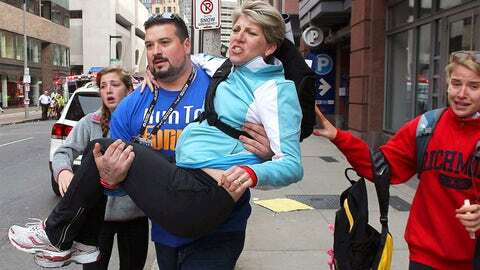 And while Zerilli will be running for Martin — a little boy who loved sports and ran the Boston Athletic Association’s Marathon Weekend Children’s Relay three times — she will also run for her own family and her class of elementary school students in the hopes of proving that despite last year’s tragedy, there is nothing to fear. “We’re teaching them about not backing down, not living your life afraid, enduring and just what you can do when you gather with people, how you can overcome things,” Zerilli said. “And we’re teaching them the tradition of it all as well. Boston is strong, and I think we need to model what we mean when we say Boston Strong.